100 Minutes Until Fall Creators Update of Windows 10! According to Tweet by Dona Sarkar there is only 100 minutes left before it is all cooked and done! Jay! The Fall Creators Update of Windows 10 is around the corner! UPDATE 10/10: As part of final preparations for the general availability of the Windows 10 Fall Creators Update on Oct. 17th, we have begun releasing Build 16299.15 to Windows Insiders in the Release Preview ring. If you are in the Release Preview ring and don’t see this build offered yet – be patient as it will be rolling out over the course of the next few days to everyone in the Release Preview ring. This, almost certain, means that we are done with Windows 10 Fall Creators Update and this (version 16299.15) will be the final release version to be released next week October 17th. The Release Preview ring is considered to be the most secure ‘preview’ ring for people who want to get bits early but don’t want to take the risks of breaking things that come with other less secure build flights such as the Fast or Slow Ring. So there you have it … Windows 10 Fall Creators Update is cooked and done if you ask me. 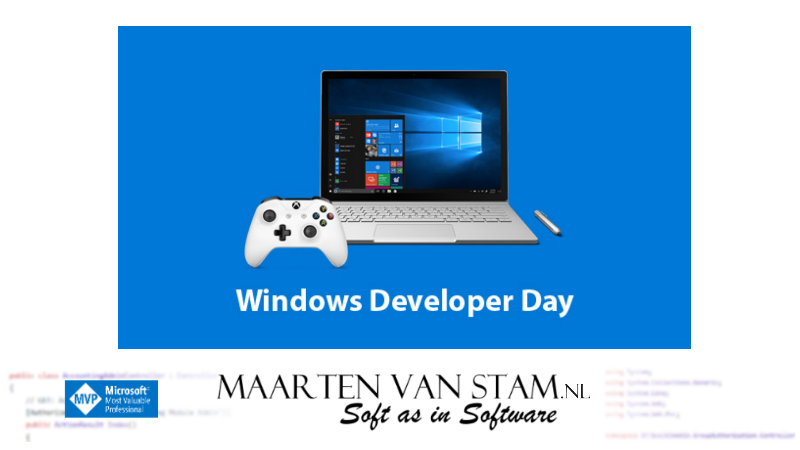 They also released the Windows 10 SDK at the Windows Developer Day yesterday (10/10), another sign that things are ready. The SDK usually locks down way before locking down Windows itself, because software developers need a solid base to build their Fall Creators Update versions on, still they released it yesterday. A special day with lots of Ten numbers, waiting for next week with both Ten and Seventeen in the name. But what’s in a name? 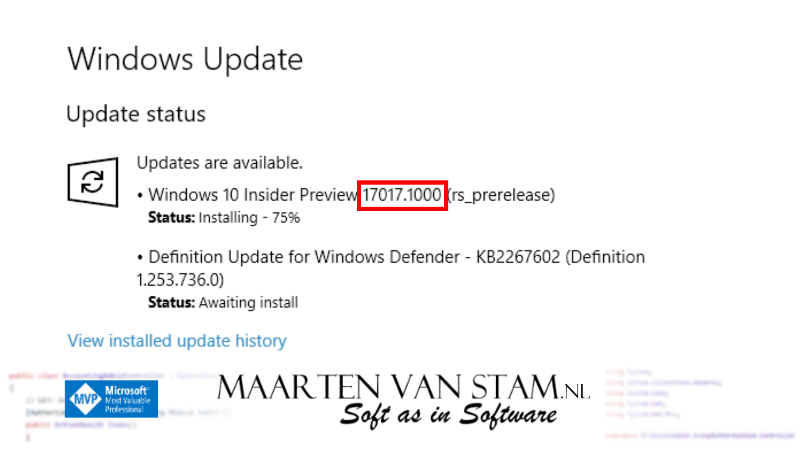 The version seems to be 1709, not 1710 although the links contained 1710 the titles are updated to 1709. So, eat your heart out … I won’t hear you again for the next couple of hours/days when you are going over all the new stuff. Only on the Fast Ring of Redstone 3 (Fall Creators Update) and not on Skip Ahead (Redstone 4). Just some bug fixes, the list is getting shorter and shorter …. Darn …. these Windows Insiders Program dudes go faster than light! 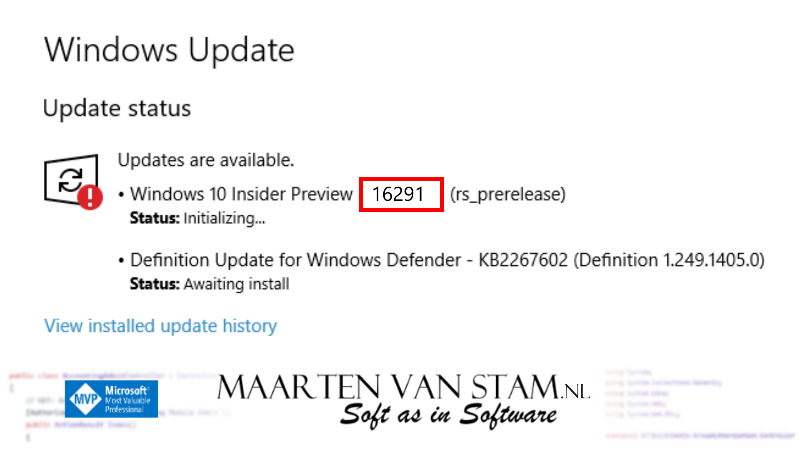 I just blogged about the 16294 build that I personally missed. Posted the blog, checked the Windows Insiders Program and guess what? Another build! Fast ring only, Redstone 3 … not the Skip Ahead, Redstone 4. IMPORTANT NOTE: You will be unable to install *new*/additional language packs on this build. Pre-existing language packs (language packs you’ve installed previously) will carry over and work just fine. We are getting closer and closer to the final release. Hardly a prediction anymore. I haven’t heard anything about it, but would Ignite be an opportunity for release? Sadly, I won’t be there to watch it live … but the keynote is streamed live so I’ll be at the monitor Monday afternoon. Another day, another Insiders Build for the PC in the Fast Ring of the Redstone 3 (Fall Creators Update) flight. Not for Skip Ahead (Redstone 4) this time. This is still a stabilizing build to get ready for release soon. Not much new, couple of fixes, but still a new thingy in this build: Resume from phones to PC with Cortana. If you started reading your articles or news on your iPhone or Android with the Cortana app you can continue reading on your PC.